Like many fans in Hockey Heaven I expected the Sabres to come out like world beater last night against the team that sent them packing in the playoffs last year. Forecast was for Sunny skies to return back to Pegulaville, but instead a big Thunderstorm rolled in. The Sabres forgot that the game started at 7:30 Philly didn't. By the time they realized the game started they were in a 3-0 hole. The Sabres rebounded and controlled the game for the remaining 53 minutes of the game but ended up walking away with a 3-2 L at home (1-4, Helsinki doesn't count). Many can be to blame for this poor stretch, lets start with the Head Coach Lindy Ruff who called himself an idiot in his post game presser. Ruff thought he would be slick and put Leino up with the best players on the club in Vanek and Pommer. That last all of 1 shift and it was back to 26-72-29 and 23-9-21. As the game went on you started to notice that Leino was getting it going with Roy and Staff. He has played more then 1 game with that duo and they were perhaps the best Sabres trio last night. Leino needs a chance to build chemistry with someone. Pierre McGuire hit on the head last night in the broadcast saying Leino is not a center. Keep him at wing it was a whiff in the offseason but he can still produce at wing, go get a center that can play center. Somebody needs to go down to the FN Center and put handcuffs of Lindy and say "don't touch!". Ruff needs to leave the lines alone for at least a week, only thing I'd change is split up Leo and Ehrhoff both are not off to great starts. Let's get to the 8,000 LB gorilla in the room, Ryan Miller. He was down right awful last night. Goals 1, 2, and 3 were all on him. Maybe on the 1st one he should have someone tying up a stick in the slot, but any goalie knows you do not kick a huge rebound into the slot. 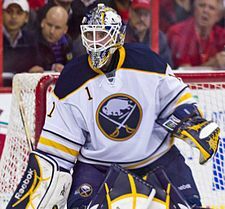 Enroth enters and makes 15 saves a few solid saves to keep the Sabres in it. Now I firmly believe Miller is the #1 goalie but that title is slipping quickly. He was given a Bronx cheer last night and a louder cheer when he exited and Enroth entered. Miller had curious comments after the game. Didn't take responsibilty for his performance and hurt his image with the fans with his other comments mentioning the fans "they bought there tickets....cheer when I make a save boo when I don't...whatever". Doesn't seem like a bad comment unless you hear the sarcastic tone that came along with it. I believe Miller should take a seat this weekend for BOTH games and get his head right. Now all in all RELAX!! It's 11 games my fellow Pegulaville citizens. This team is good team and will get going. Leino will score, so will ehrhoff, and so will the other struggling players. Also don't forget Ennis is out as well, when he returns he will provide more scoring. Just take a deep breath and let it play out. The next 5 games are winnable and we can be sitting here next week saying how awesome these guys are (Flames, Sens, Jets, Bruins, and Sens). If we are still here after game 20 or 25 then maybe we hit the panic button. Glad to see Ruff going with the hot hand this weekend. Miller needed some time to work on his mechanics, he goes down way to soon, everyone knows it so they just shoot high on him all the time, top shelf is always open. That 1st goal Ryan was on his belly as the puck went in the net, how many times have we seen that already this season?